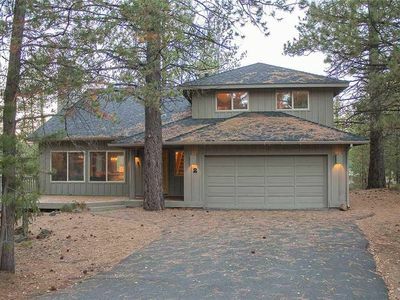 Sunriver Condo with Private Amenities! 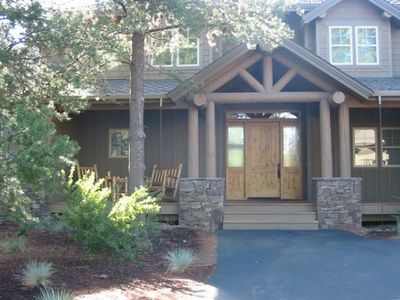 Pool, Hot Tub, Tennis Courts! 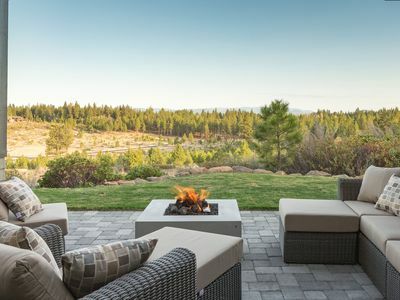 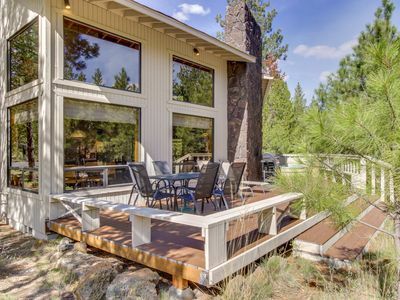 If peace and quiet is what you seek while on vacation in Sunriver, then Quelah 28 is the perfect place to stay. 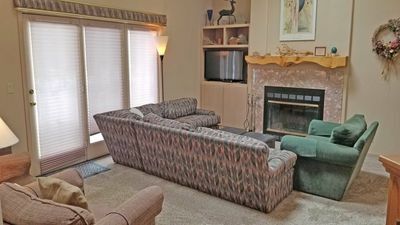 This end-unit condo includes 4 bikes, access to the private community pool and hot tub, and with two private tennis courts available only to the guests of the Quelah condo unit, you will find yourself coming back year-after-year. 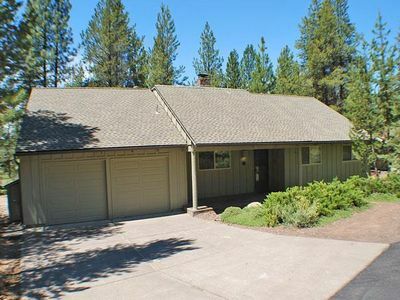 With a newly remodeled kitchen and bathroom, this three (3) bedroom, two (2) bath condo is ideal for those who enjoy a cozy atmosphere when it’s time to cuddle up next to the wood burning fireplace or watch nature unfold right before your very eyes as you sit out on the private bedroom deck with a cup of coffee and experience the beautiful Sunriver sunrise. 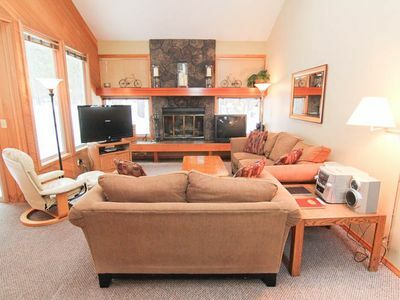 Upon entering the condo, you will find a large seating and storage area for all your wintertime fun equipment. 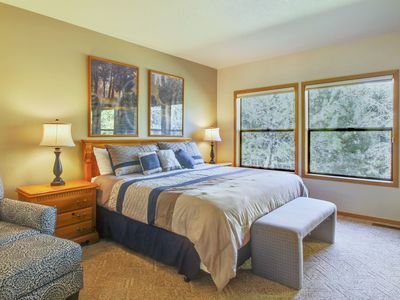 Master bedroom with king size bed is on the first floor along with an extensive Disney movie collection for your family to enjoy. 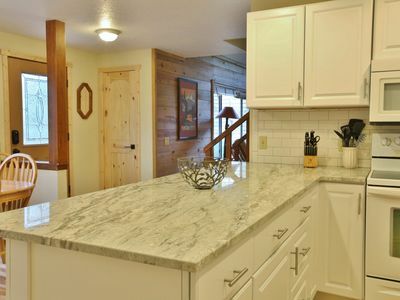 Also, on the first floor you will find a full bathroom with double sink vanity and large walk-in shower. 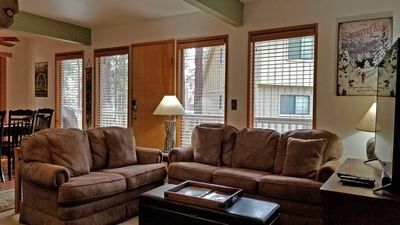 Walk further into the condo and you will find that cooking in the newly remodeled kitchen an absolute joy with modern appliances. 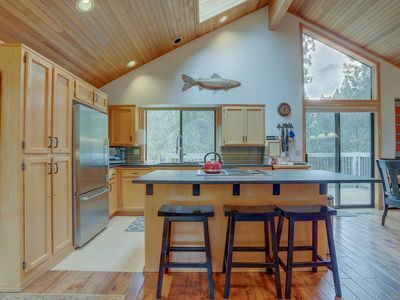 And with an open floor plan from kitchen to dining room and living room, the conversation flows easily so you can cook while visiting with your friends and family members. 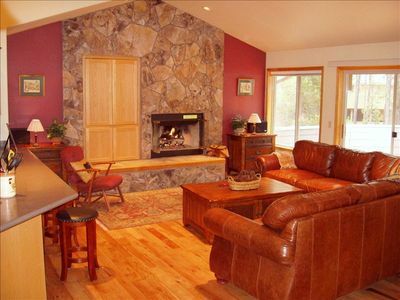 Light a fire in the majestic fireplace, surrounded by windows, in the living room and watch the snowfall. 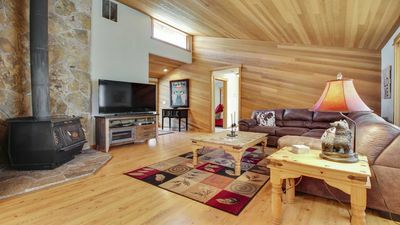 A community hot tub (year round) and pool (seasonal) are also available. 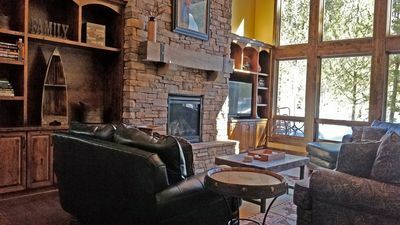 When your adventures take you to the outdoors, this unit now provides 2 complimentary passes to the Nature Center and Observatory. 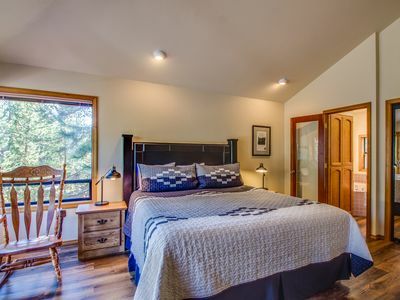 They can be used unlimited times a day during your stay! 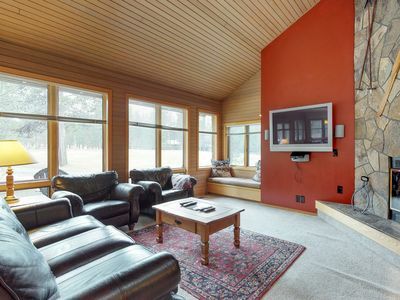 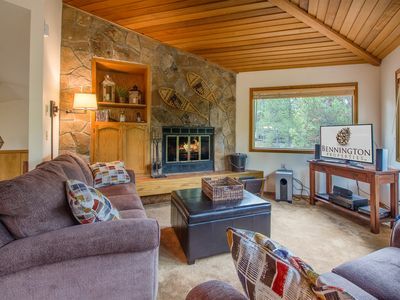 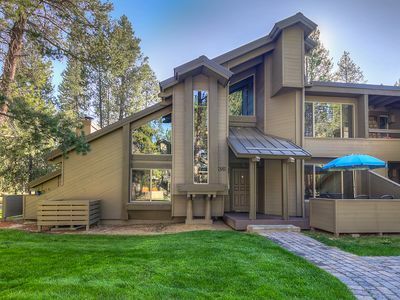 Luxury Ponderosa Pines Lodge, 5 BR/3.5 BA at the River! 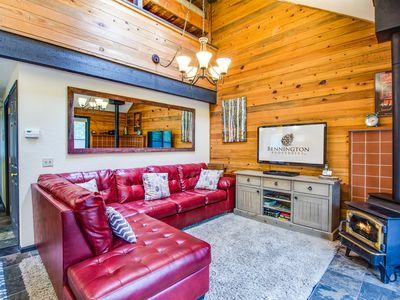 This wonderful styled layout of our Tennis Village Condo is close to everything! 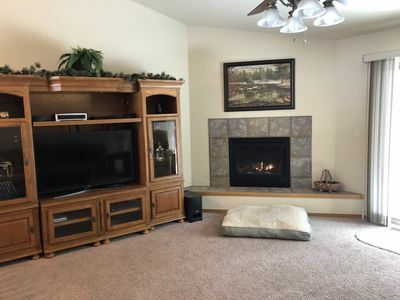 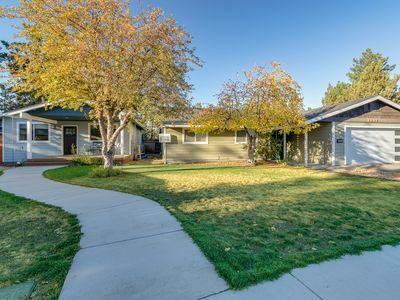 Spacious home near Fort Rock Park, Bike Trails, and Free SHARC Passes!